Man! I found the perfect shabby chic antique floor lamp at the junk shop. It’s made of iron and was painted white at one time. The paint is perfectly crackled and chippy. The lamp was a deal at $15. I know just what I’m going to do with it. You remember the reclaimed light fixture I made an Easter display out of? After Easter I’m going to replace the decorations with a candle…..the battery kind. Then I’m going to remove the wiring and socket from the lamp and hang the light fixture with candle. Awesome idea, right?? I bought the chest of drawers and already have a plan for it. You’ll have to wait for the reveal. The chest was $25. The wood fence panel was $7 and I have no plans for it yet. Maybe just as a backdrop for my projects. It’s white on the other side. The faded paint on the wood window frames was calling my name. The windows were $5 each. I also found more French Provincial drawer pulls, six of them. 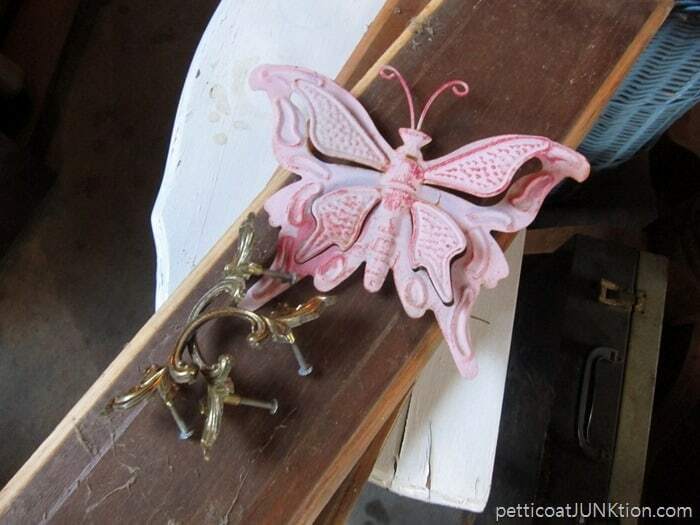 The pink tin butterfly was just too cute. It’s not vintage but what the heck. The two drawer panels will make perfect signs. I wanted the yellow and black picnic box but it was too pricey for me. It was either $15 or $20. How about the long Church pew. If it was half the size it would come home with me. This is a stack of goodies another shopper was piling up when I arrived at the shop. Another case of 5 minutes too late. I want to thank everyone for your comments on my REAL HOME story yesterday. I enjoyed reading everyone of the comments and hope to reply to them soon. It doesn’t bother me that my home is cluttered and I sometimes don’t get Christmas stuff put up for months. When I was younger it would have, but now I’ve just learned to go with it. Enjoying Life. What do you think of my finds. Leave me a note and come back Sunday for the April Craft Supply Giveaway. There are 5 bloggers and 5 boxes up for grabs again this month. See you then! Kathy Owen you just awesome. Love the fence, Butterfly, Floor Lamp, Iron angle all of those items. You choose a wonderful Job. all of these are antique item. Love your finding eyes. I would have bought the yellow picnic tin, been wanting a yellow one. 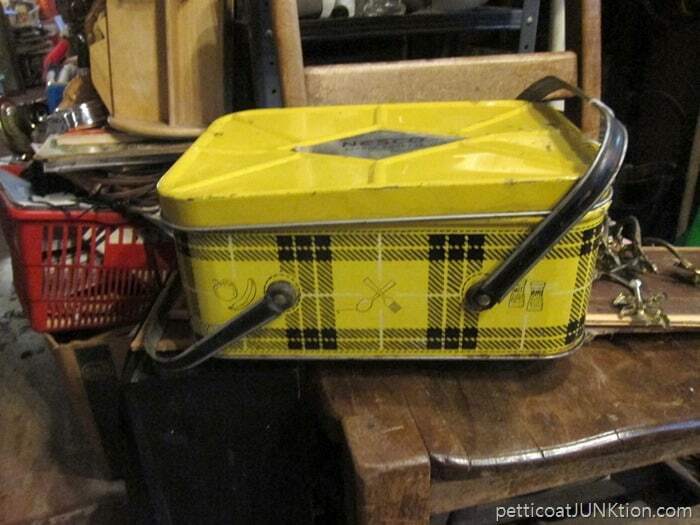 $15 or $20 is the ebay price for a rusty &/or dented tin, & then shipping on top of that. (Just checked ebay & currently a nice yellow one is $50, one with free shipping the other with $20 shipping–ouch!) Love the lamp. 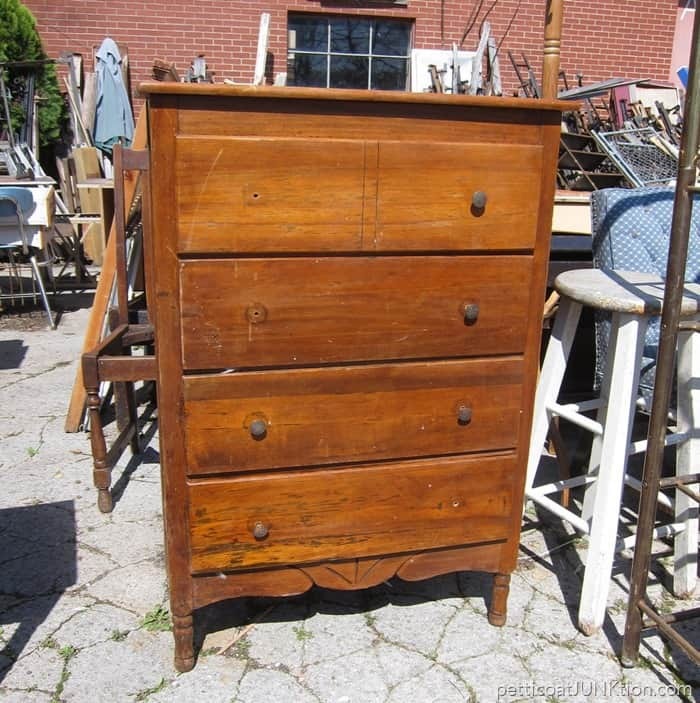 The chest too with its little turned legs & curvy bottom trim. OMG! I’m soooo jealous! I’d love to find a place like that to plunder through! you got some great finds! 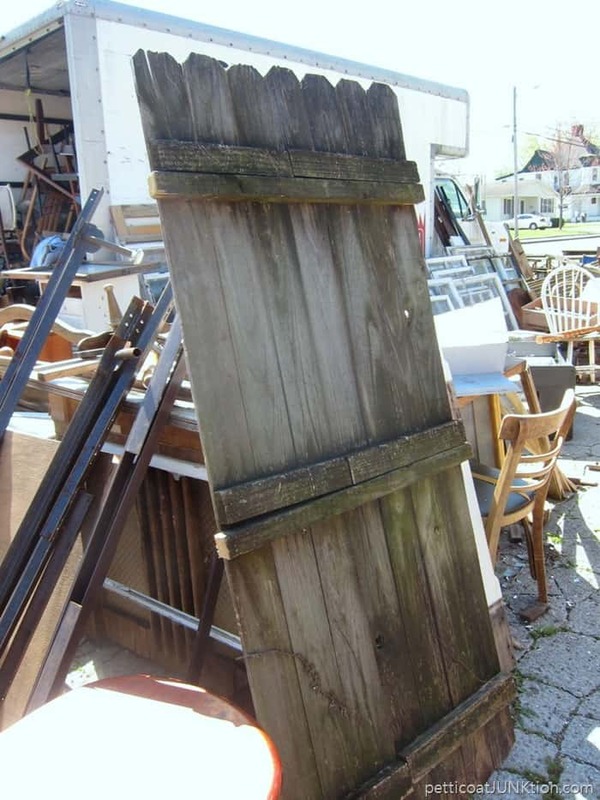 Great finds… love the fence! Great idea for the lamp! Also, have a wood door/panel in my thoughts. Have not decided what to do with it, yet. The church pew length is a problem, but could it be cut in half, shortened, then miter the ends and reconnect to form an “L” shape? FYI, I Highly recommend AgingCare.com. It’s for caregivers. A lot of information about dealing with our aging loved ones, and sometimes, not-so-loveable ones. 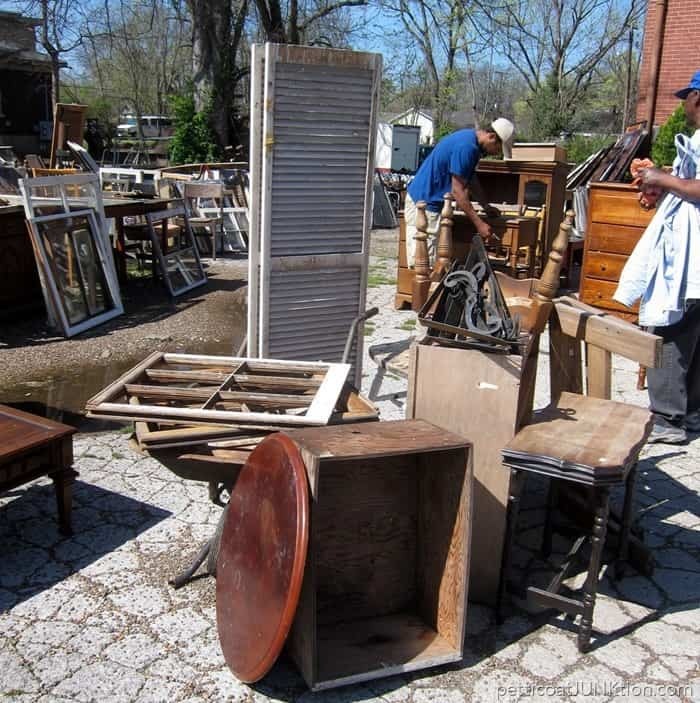 What an awesome junk shop you have nearby, the finds are incredible! The best part is seeing what you come up with for your finds!!!!! I love your finds. 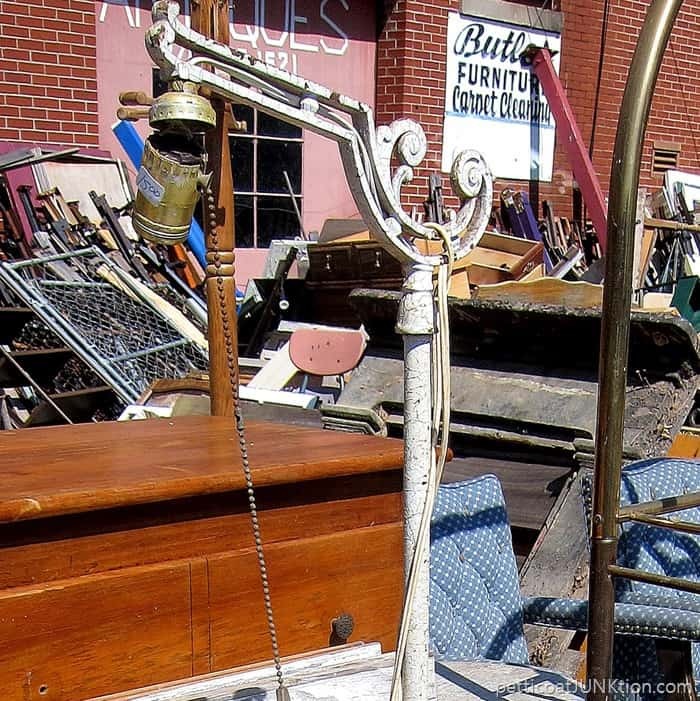 I’ve got to make a trip to our local salvage yard soon! Have a great day my dear. Great buys and yes, that pile the other shopper has is very good stuff too! I ❤ your junk shoppin! I think every weekend that I’ll get to Hoptown to visit Butler’s for the first time but I haven’t made it yet. Maybe my next vacation day…. You did great, again, choosing wisely! 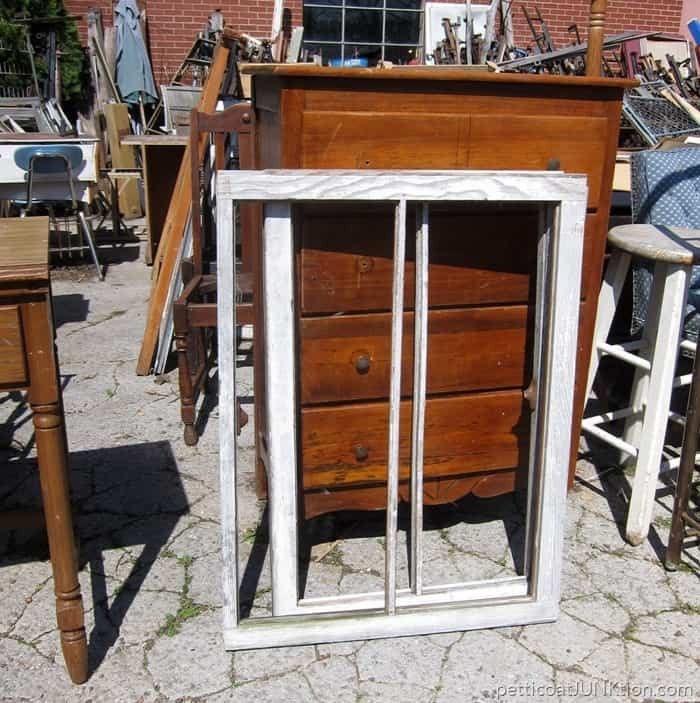 I love the chest and old windows – endless possibilities. I adore that yellow plaid picnic hamper as well. 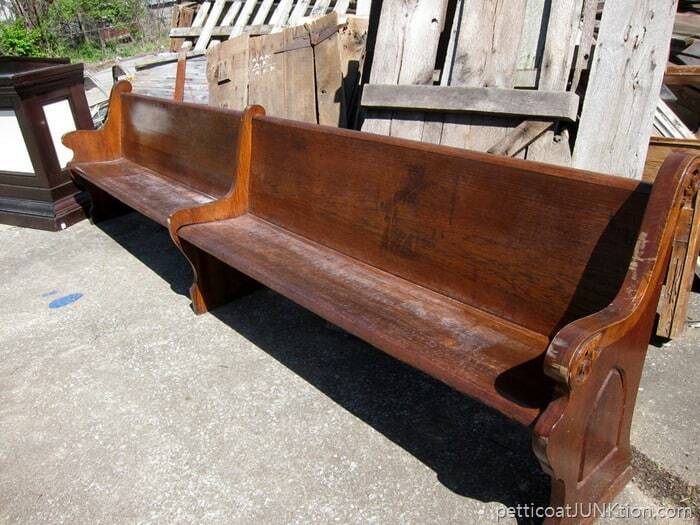 The church pew was beautiful – I’d cut it in half – add the left armrest part at the center – or whatever length would fit in your house/on your porch, and use the remaining part for a smaller bench – maybe finding arms or corbels that might fit on it???? 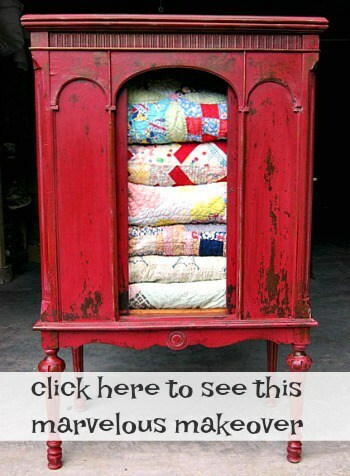 What fun – thrifting and bringing home beautiful old stuff to repurpose! 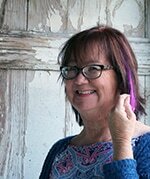 Kathy, you do such a great job, helping your parents and dealing with your mom’s Alzheimer’s and keeping at it with the JTS! I’m proud of you. Wowzers, what finds! Makes me want to step through my computer screen and shop! Love the lamp, I can’t wait to see what you do with it. This is my kind of junk shop, I love to rummage through stuff like this, I would have been thrilled to find that floor lamp as well. Looking forward to the chest project too. Had a similar one myself.Used it for a hanging plant at our non- profit store had it on display less then an hour!! Would love the black and yellow basket Iowa Hawkeye colors. 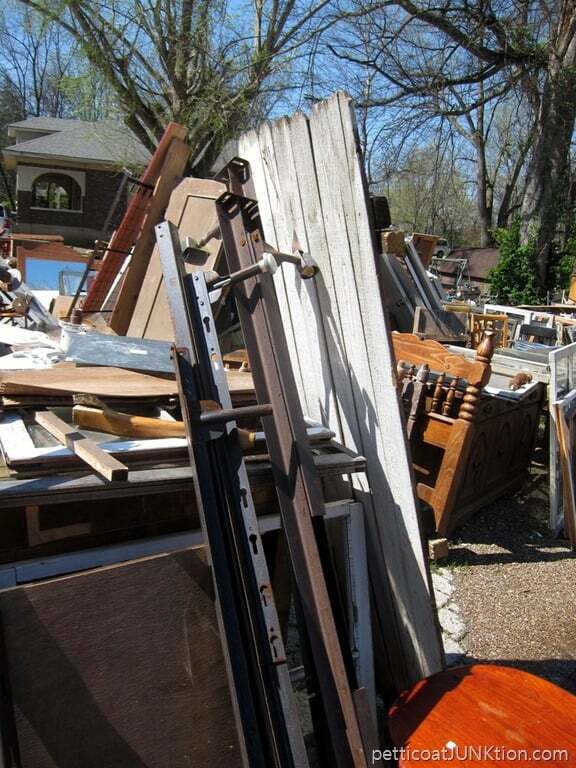 But the deal was that fence panel and dresser. 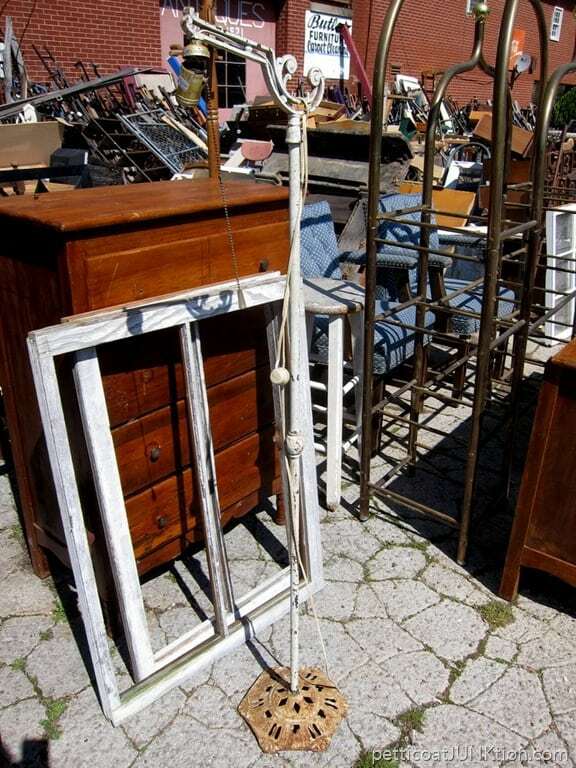 Your finds are the best.What a fun place to treasure hunt.Can’t wait to see the dresser- the last one was stellar! Love everything! ! Great idea for floor lamp. Can’t wait to see results!